Pope Francis has rekindled hopes for peace in South Sudan by kissing the feet of President Salva Kiir and Vice President Riek Machar as they wound up a 2-day historic spiritual retreat to the Vatican on Thursday. The sworn enemies whose bitter struggle for power left more than 400,000 people dead during a bloody five-year civil war, are under pressure from international stakeholders to form a government of national unity in May. The deadline was set in September last year after the signing of a UN-brokered armistice by Kiir, Machar and other belligerents. Kenya's Standard reports that Salva Kiir, Machar and three other Vice Presidents were shaken when the 82 year-old Pope went down on his knees to kiss their feet. "I am asking you as a brother to stay in peace and not to allow the many problems overcome us", said Pope Francis in the improvised remarks made at his Santa Clara residence. In Uganda, the Daily Monitor quotes observers as saying that while the May deadline ticks in, the implementation of the deal has stalled with Kiir and Machar yet to negotiate security control of the capital, moves to establish a national army among other sticking points. Despite the armistice, one third of South Sudan's 12 million inhabitants have been displaced by the 5-year civil war with seven million people facing severe food shortages , according to three specialized UN, agencies. In his first reaction to the extraordinary event in Rome, the Auxiliary Roman Catholic Bishop of Juba, Monsignor Santo Loku Pio Doggale hailed Pope Francis for "the highest exhortation of South Sudan's leaders to accept the terms of peace. 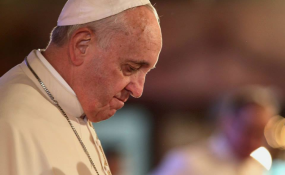 "Everybody I talked to this morning is very happy and overjoyed that the Pope had done his best", said Pio Doggale in a telephone interview with RFI. According to the bishop of Juba, while it was tough to get Salva Kiir, Riek Machar and the others on board, their Christian faith facilitated their decision. Monsignor Santo Loku Pio Doggale also commends the role played by the Archbishop of Canterbury Justin Welby, who proposed the idea of the retreat to the Pope , Juba's Archbishop Monsignor Paulino Lukudu and South Sudan's other spiritual leaders. "They never stopped exhorting them to lay down their arms, end the senseless suffering and look for a better way of resolving the conflict", the bishop noted. Monsignor Santo says the presence of the Church leaders at the Vatican retreat was crucial so they could hold the war mongers accountable for the pledges made in front the Holy Father. "Our first target is to improve the degree of will of the two leaders". "They are the ones who triggered the differences at the lower level", he noted. One issue Bishop Goggale raised as having complicated the mediation, is Riek Machar's absence from Juba for quite a long time. "He flew to Rome from Khartoum and that is where a lot of doubt has been", he said. According to the Catholic cleric in Juba, "If office disagreements are not allowed to spill over and as soon as he is here in Juba, holding hands with all the other leaders, then that will be a key moment of reconciliation of the ordinary citizen".